Height 5 feet 9 inches. Weight 170 lbs. Chest 36-38½ inches. Complexion fair. Eyes blue. Hair fair. Sight, hearing, colour vision, heart and lungs all normal. Limbs and chest well formed. Full & perfect movement of all joints. No illnesses. Free from hernia, varicocele, varicose veins, haemorrhoids, inveterate or contagious skin disease. Vaccinated. Good bodily and mental health. No slight defects. No fits. 5 January 1915 had fracture of tibia caused by railway truck; five months off work. Michael James Scannell was born on 5 February 1888 at Kerrytown, Timaru, the sixth son of Daniel and Ellen (née Foley) Scannell, of “Lyalldale”, St Andrews, South Canterbury. He was baptised three weeks later, on 27 February 1888, in the Temuka Roman Catholic parish. Michael was educated at the Kerrytown Convent School, in which vicinity the family lived before moving to the St Andrews district in the early 1900s. He took a keen interest in football. After leaving school Michael assisted his father on the farm until he joined the Railway Department in about 1911. His parents and some brothers, including Charles, contributed to the Home Relief Fund for the Poor of Great Britain, Ireland, and Belgium in September 1914, by which time Michael was stationed in Albury as a platelayer, and to the Lyalldale Red Cross Fund in July 1915. Michael and his brother Charles both enlisted with the Sixteenth Reinforcements on 3 May 1916. By this date Michael was a railway porter and living in Lyttelton. He had served with the New Zealand Railway Engineers, being discharged when he was transferred. A well built young man, Michael was 5 feet 9 inches tall, weighed 170 lbs and had a chest measurement of 36-38½ inches. He had had five months off work from 5 January 1915 after suffering a fracture of the tibia caused by a railway truck. It was noted that he was “a very suitable man”. His mother, Mrs D. Scannell, was his nominated next-of-kin. A social to bid farewell to Privates M. and C. Scannell and three other locals was held in the Lyalldale School on 20 July 1916. Admission: Ladies a Basket, Gents 2s. Michael embarked a day earlier, on 20 August 1916 per the “Navua”, with the 16th Reinforcements of the New Zealand Expeditionary Force and destined for Devonport, England. At Sling he was posted to the Canterbury Infantry Regiment and after training proceeded overseas in December 1916 to join his battalion on 16 January 1917 at Rouen. On 7 June 1917, in the taking of Messines Ridge, Michael James Scannell was killed in action; one of 237 reported killed in action in two casualty lists circulated on 20 June. 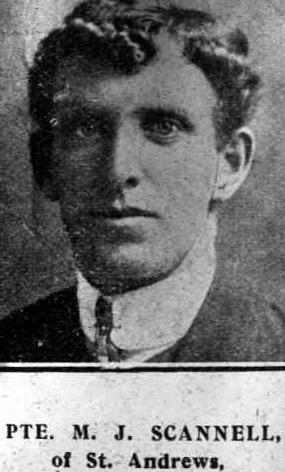 His parents received word of his death in mid June and placed a notice in the Timaru Herald, and in the New Zealand Tablet – “He gave his life to protect the rights of small nations.” Although the Battle of Messines was a striking success, the New Zealanders paid a heavy price for success – a price paid in the life and future of Michael Scannell. Having no known grave, Private Michael James Scannell is remembered on the Messines Ridge (New Zealand) Memorial, Messines Ridge British Cemetery, Belgium; and his name is inscribed on the Timaru Memorial Wall, the Lyalldale War Memorial, the St Andrews War Memorial, the Timaru Sacred Heart Basilica Memorial and the Albury Football Club Roll of Honour. Within the short space of eleven days Daniel and Ellen Scannell lost two sons in the war – Michael killed in action, 29 years old, and Charles of disease at 25 years. Michael was remembered as one of the most popular young men to have gone to the Front from the Lyalldale, St Andrews district, where very sincere sympathy was felt for his parents and relations in their double bereavement. The names of Michael James and Charles are inscribed on their parents’ memorial stone in the Timaru Cemetery. An In Memoriam notice was inserted by his parents, brothers and sisters in the Timaru Herald of 7 June 1918 – In sad and loving memory – “It was hard to part with one we loved so dear.” For some years after, his family faithfully inserted an In Memoriam notice in the New Zealand Tablet. A photo of Michael and Charles in uniform was printed in the Star of 19 July 1917, both showing expressions of trepidation. His medals - British War Medal and Victory Medal, plaque and scroll were sent to his father at St Andrews in 1921. M. J. Scannell left a Will dated 3 October 1916 and deposited with the Public Trustee. He left all his real and personal estate to his mother, Ellen Scannell the wife of Daniel Scannell of St Andrews, and should she have predeceased him, to his sisters Julia, Mary, Agnes and Norah, all of St Andrews. He had a life policy to the value of £185.3.4, Superannuation fund refund of £40.4 and Military pay of approximately £20. Three of their brothers - Francis, Jeremiah (Jerry; fit only for Home Service) and Joseph (Joe) - were called up for service in the war. Two nephews of Michael served in World War Two - Patrick Louis Scannell who was killed in action in 1944 in Italy and Pte John Joseph Scannell who died in 1943 and is buried in Timaru.